Animal Wildlife | Highland Cattle | Highland cattle (also known as the hairy cow) are an old Scottish breed of cow, bred primarily for their beef. 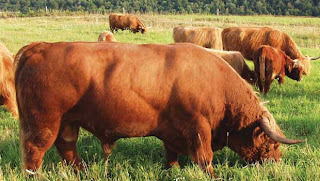 Highland cattle are often bred for cattle shows, and some highland cattle can win many prizes due to the incredible condition of the highland cattle individuals. The highland cattle are famous for their long haired coats which help the hairy cows to cope with the harsh conditions of the Scottish Highlands. The highland cattle inhabit areas of Scotland close to the Arctic circle meaning that the highland cattle have adapted to endure the most uncompromising conditions. Highland cattle originally come from Scotland. Highland cattle can now be found in Europe, North America and Australia, where the highland cattle are all commonly farmed for their meat but some people also use the long hair of the highland cattle. 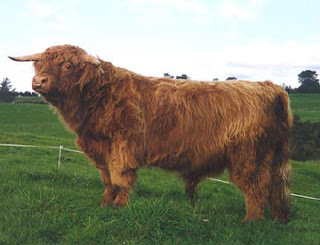 Highland cattle have adapted to living in such harsh terrains as highland cattle have a large, strong build and a thick double layer of long orange hair. Highland cattle also have two horns on the tops of their heads which the highland cattle use to dig through thick snow to find the vegetation that lies underneath and the highland cattle also use their horns in order to defend themselves from oncoming predators and other rival highland cattle. 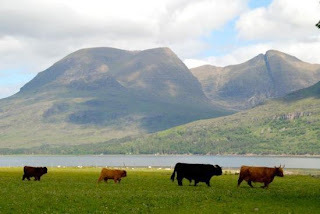 The highland cattle are also extremely adept at foraging for food and the patience and skill of the highland cattle means that the highland cattle can often be found grazing on steep, mountainous slopes in the Scottish highlands. Highland cattle are herbivorous mammals and therefore only eat plant matter, mainly grasses. 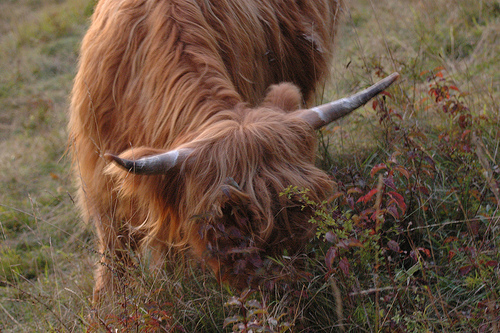 Highland cattle are also known to eat leaves from low growing trees and shrubs and the highland cattle are also rather partial to the odd flower! Due to the sheer size of highland cattle, other than humans highland cattle have very few natural predators in their wild habitat. Depending on the location of highland cattle, packs of wolves are one of the main threats to grazing highland cattle and those highland cattle inhabiting the plains in North America, are also in fear of being hunted by larger animals such as mountain lions, cougars and bears. Coyotes in North America are also a threat to the young and weak highland cattle calves but it is too dangerous for the coyote to hunt a highland cattle calf unless the young highland cattle has been separated from the group. 0 Response to "Highland Cattle"